I hope your Christmas was wonderful – and a happy new year! 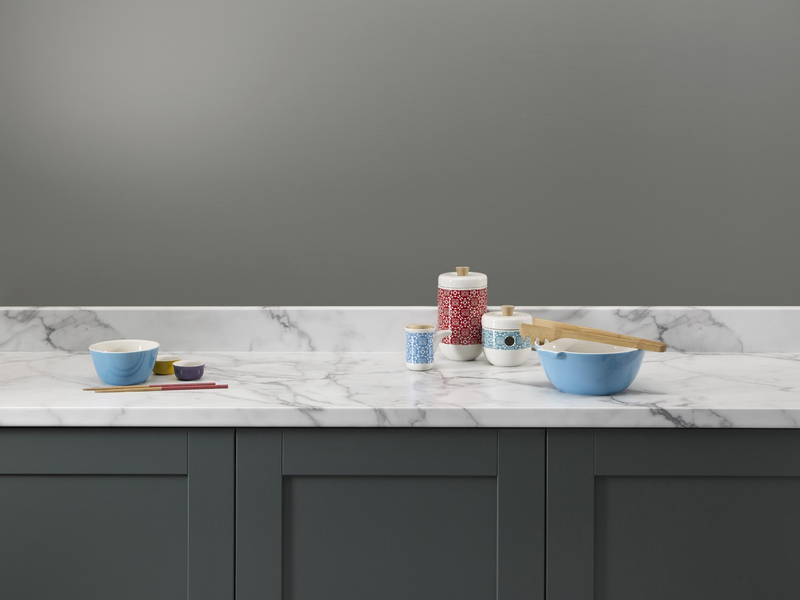 Before the flurry and bustle of all these celebrations I was busy setting out some helpful pointers for choosing a work surface in your kitchen. 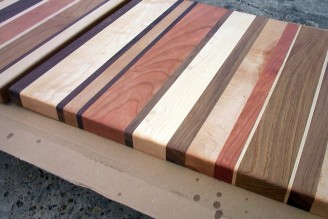 Mainly because I made up the title for this article (not in the slightest bit contrived), but also because wood, laminate and stone do seem to be some of the most popular worktop materials, I thought it would be good to focus on these three. The warm tones of a wood worktop are beautiful in a kitchen, but it will need a bit of care and regular attention to keep its good looks. Wood and water are not the best neighbours, and a sink area will need to be kept free of splashes and pooling, so unless you have a very rigorous and tidy approach to your washing up, it would be probably better to consider another more watertight surface for this part of the kitchen, if you can. Some wooden worktops do have ridges carved out for draining, and some seem to survive the daily onslaught, but these are the ones which are kept in a ‘dry’ state, and are oiled regularly (every six months) to maintain water resistance. In addition pans left to dry can transfer a black mark onto the wood which can be sanded out but may prove to be a hassle over the long term. Reliable woods seem to be oak and iroko, and possibly walnut, and all consensus seems to be that you should invest in good quality timber, be prepared to undertake a little maintenance work now and then, and make sure your fitter comes well-recommended. 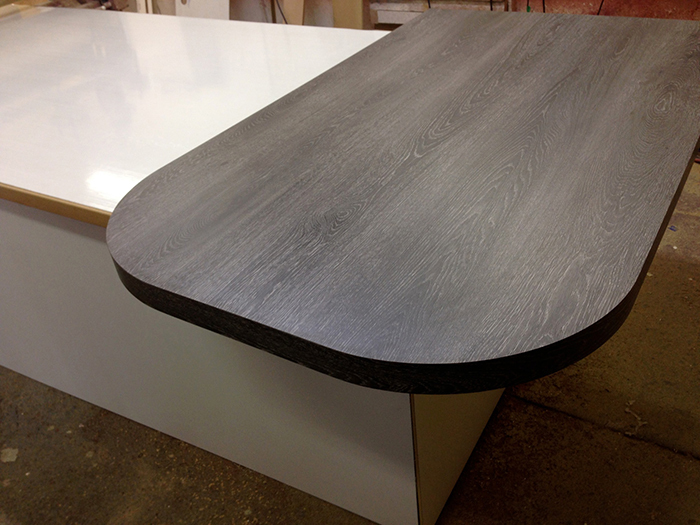 You can create a beautiful wrap-around effect by installing your worktop wood up the sides of an island unit or even around a tall cabinet block. You can buy real wood worktops in ready-cut lengths from retailers like Ikea, B&Q and Homebase, as well as in countless online stores. 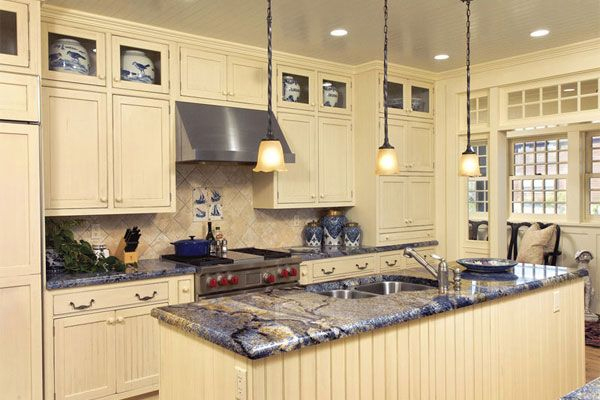 The prices are extremely reasonable and you can carve out all manner of interesting designs if you have the skills and invention, but bear in mind, longer-length counter tops will need to have joins, which may not look so good. I suspect the quality of the wood is not as high as a bespoke sourced and cut piece, so you may encounter more problems with swelling around sink areas and joins. 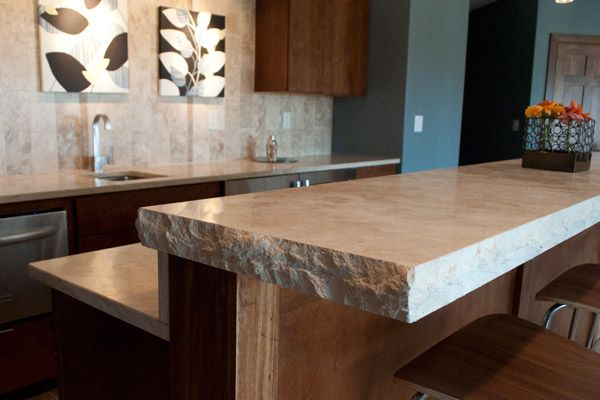 There are some pretty impressive laminate work surfaces out there these days, so if you’re on a budget with your kitchen redesign, don’t despair about your choices. 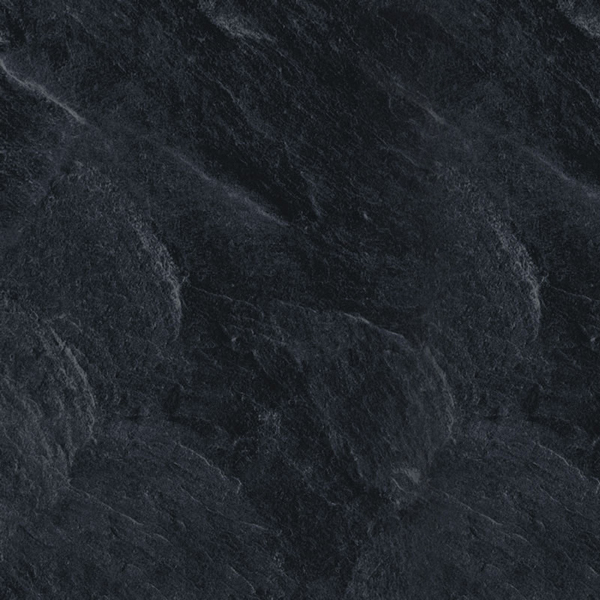 Wood or stone effect images are many and varied, and are relatively good-tempered provided they are fitted correctly. Perhaps the most important first task is to work out your specs. Most laminates come in 4cm thick blocks, and range in length from 1.86m for the smallest Ikea offering, to 4.1m for the quality Duropal or Axiom brands. Obviously, the longer the lengths, the fewer joins you will need to incorporate. In a recent job I worked on, the Ikea kitchen we designed had some sweeps of work surface which would have looked simply scrappy if we’d used an Ikea worktop. So we had to look elsewhere. Another important consideration is the depth of your units. Often laminate surfaces are offered with a minimum depth of 60cm, but do check that this actually covers the units you’ve chosen – Ikea units need at least 63.5cm, and most companies offer a range of depths: 60cm, 67 (or thereabouts) and 90 for an island. Loving the marble trend but can’t justify the prices? 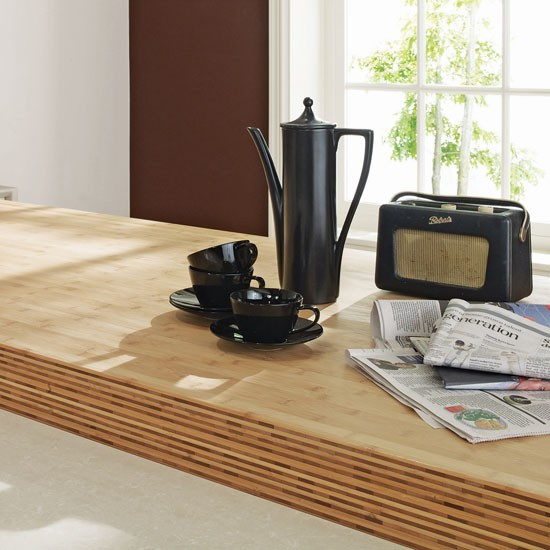 Fancy using some coarse-grained wood as a feature but know that it won’t deal well with the kitchen environment? I’d recommend visiting a supplier to see and touch samples. 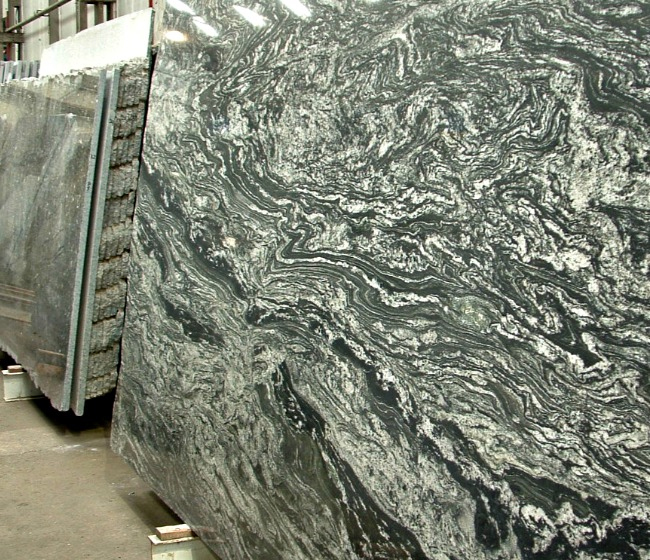 You get a feeling for the texture, which might be smooth, gloss, grained, or crystal. It’s hard to tell the way a surface catches the light by comparing images on a computer screen. If you live in or near Manchester do try out Plasman, a helpful and efficient firm with a huge range in stock and competitive prices. 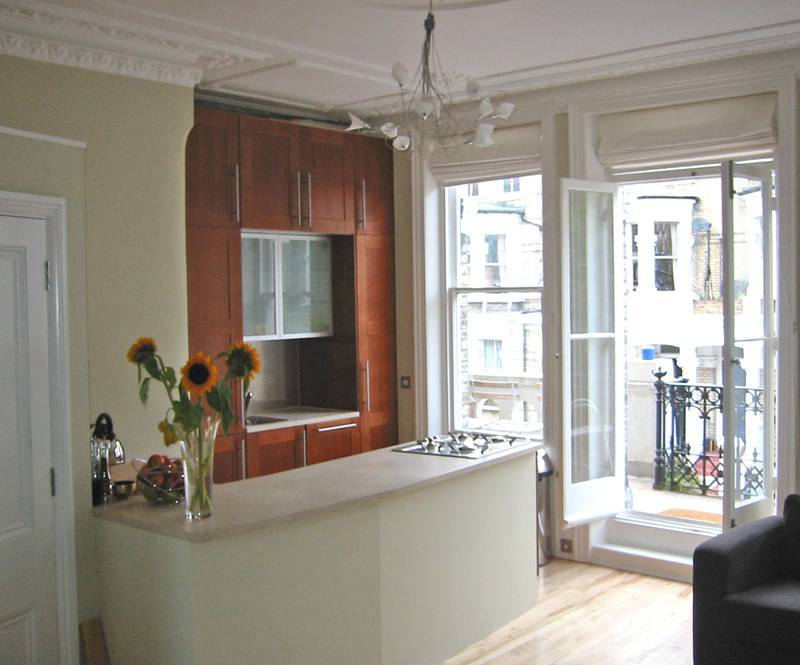 In our first home, a small conversion flat in West London, we sourced a beautiful piece of Spanish limestone for our kitchen and it was truly stunning. The greatest maintenance issue was ensuring stains never sat for long (red wine bottles were the worst) as the porous surface simply sucked it down deeper. The limestone cost significantly more than the kitchen units (which were after all Ikea) and the precut piece was extremely nerve-racking to deliver and install. Since the kitchen was a corner section of our all-purpose living area, we really wanted something that would look high-quality and not too kitchen-like. It worked from both sides — practical enough for our food-prep but classy enough to display. 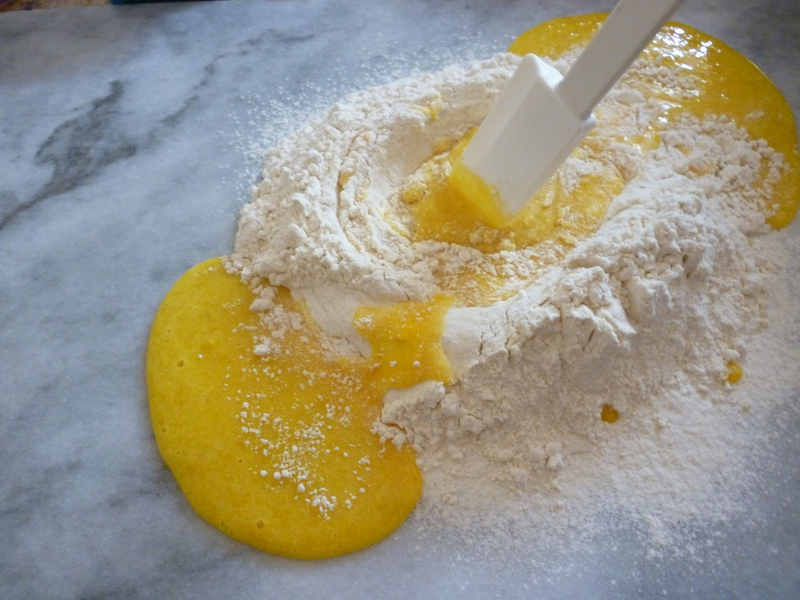 I’ve never got the knack of pastry (my mum was too good) but the cool smooth of stone is great for baking. No need to define your edges, if you don’t want. Which way do you lean? Let me know what’s worked for you — or even what really hasn’t! Today I’m bringing you a really handy guide I found on Apartment Therapy, which encapsulates the process I go through to create a kitchen from Ikea that doesn’t look like it comes from Ikea. We have used the same technique with every kitchen we’ve had: researched different, often expensive styles from well-known designers, and then chosen Ikea cabinetry and fittings which most resemble our “dream design.” Of course you don’t need to stick with Ikea for every element of the kitchen, either: our own Corian work surface from Interstyle Worktops actually came in cheaper than an equivalent composite worktop from Ikea. But for the bare bones and cabinet structure you really can’t beat the price. Read on and get inspired by Janel Laban’s clever comparisons! It was the end of October, and an icy wind was sauntering brazenly through the 5cm gaps around the door and window frames. A thick layer of dust and small stones covered the rough-finished concrete floor and a cheap stainless steel sink hunkered in a rickety plywood worktop. We’d just moved into our dream home and I was preparing party food for Caspar and 20 of his friends surrounded by breeze-blocked walls and removals boxes. This was not exactly how I’d planned it. There were positives: our shiny new stove and extractor fan were settled regally in the chimney space, we had a fridge which produced ice cubes from a dispenser (no, the irony is not lost on me) and a boiling water tap arched with surreal modernism from the jagged surface of the island unit. All our pans, plates and glassware were stowed safely in my carefully imagined Ikea units. I was operational. Just not smug. Spool forward to Christmas Day and we were cosily, brightly splinter- and dust-free, with smooth edges and warm floors. 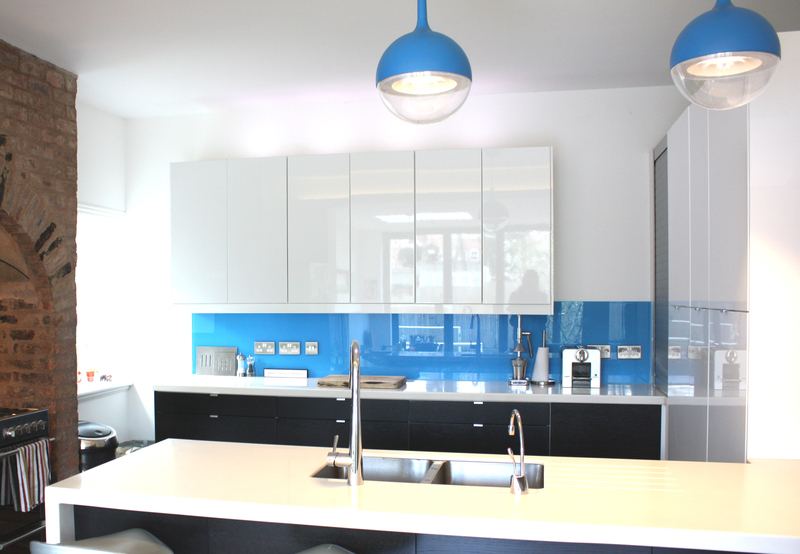 Insulation, plaster, paint, corian, walnut, glass and chrome had all happened, and our kitchen was the welcoming hub of the home. I still wasn’t smug; just relieved and rather drained. So what did we do? 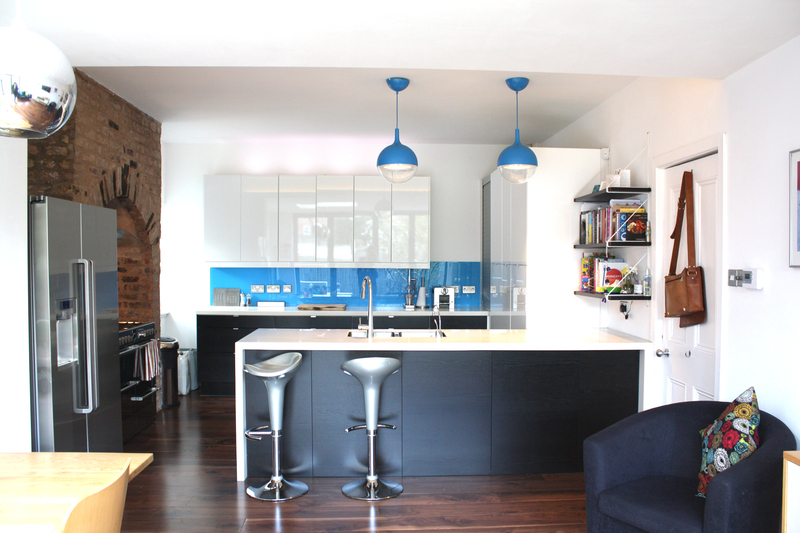 We doubled the size of the kitchen to incorporate a space for eating and hanging out, by building a one-storey extension out into the garden. 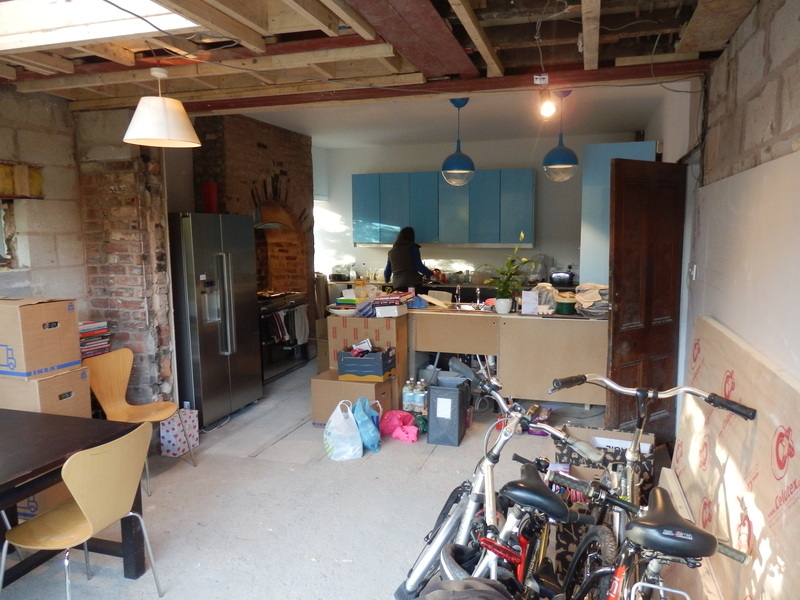 It was the one bit of proper, serious structural work in our renovation project. This left the original kitchen space free to fill with useful cupboards and drawers, a wealth of storage. And the eating and sitting area overlooks the garden through glazed bi-fold doors. Now, I love the price and practicality of an Ikea kitchen. We have long espoused the use of wide, easy-to-peruse drawers, which trump the dingy cupboard arrangement in any contest. Even our corner cupboards have the nifty wire pull-out shelves which house all the lumpy bake-, tupper- and picnic-ware. ‘Ware’ cupboards, as it were. We decided on a black-brown wood finish for the drawers and under-worktop cupboards, then a gloss white for the bank of larder doors and for the wall cabinets. Predictably, our gleaming larders also have drawers in, a mixture of wire trays and solid-bottomed. I have sectioned and categorised my ingredients with obsessive verve, gleefully stocking up on, respectively, interesting jars, spices, tins, nuts and seeds/dried fruits, cereals, pastas and grains…. You see the light streaming in at the corner of the picture? 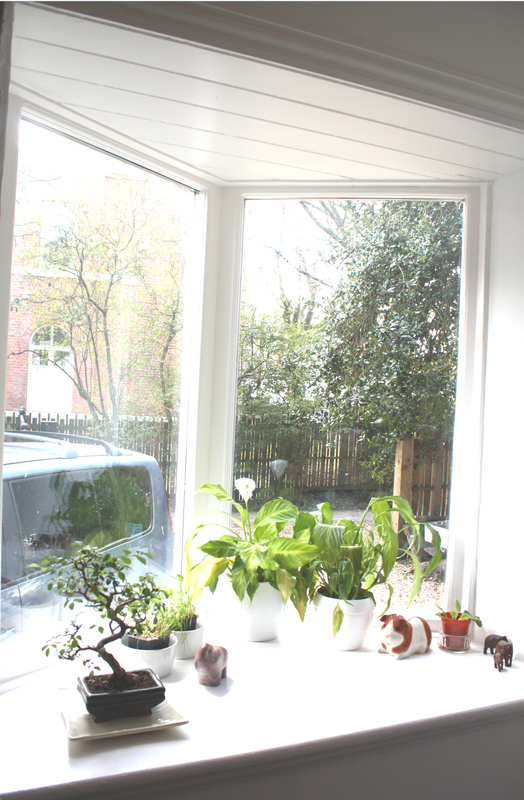 This is an incredibly cute mini-bay window with a generously deep sill which I use to house various flora and (fake) fauna. It’s not the camera exposure, those leaves are a little yellow. Nurturing plant life is rather low on my list of priorities, so only the brave tend to survive. It’s getting late. I’ll be back soon, though, with Part Two. Next time I’ll tell you about the worktop and my splash(back) of colour, and give you the lowdown on just how finicky a newly laid wood floor can be.